I’m not even going to clog up the WIP Wednesday linky party with this! Oh no, get well! My middle child has the stomach flu. Tis the season! I know how you're feeling…..hoping you get much better soon….at least in time for going out Friday. And yes, sewing is a strangely dangerous hobby – I'm always pricking myself. Hope you are much better by Friday so you can party. Don't you hate it when you can't find what you're looking for and nothing else will substitute. A good night out on Friday should kill you or cure you! Oh no 🙁 Feeling yuck is the worst! Sounds like you better have a big night at the Christmas party and drown that lurgy – lol – not the finest medical advice! I do hope that you recover faster than me – am on week 5! 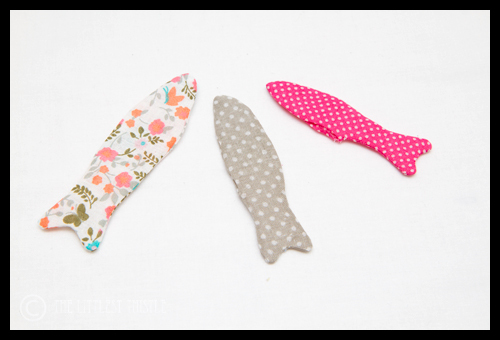 Ok…to the projects…I am still puzzled byt the fish…what are they for? Ah Katy, hope you feel better soon! We just got over a couple of weeks of respiratory cr*p, and it was no fun!! Can't wait to see the bag and fishies in all their finished splendor. And.. btw.. I think you're a rock star for cleaning out the freezer while sick. I accomplished nothing at all! I hope you feel better soon, I have just been working too hard to do any sewing. It takes me about a week to recover from a big night out – hope you feel better soon!